Most people visiting Ludlow Hut, situated near the shore of Richardson Lake, do so as part of a multi-day tour because it provides time to explore and enjoy the beauty of the area. The route described here to Richardson Lake and Ludlow Hut, beginning at Sugar Pine Point State Park and following General Creek, offers easy parking and miles of quiet backcountry skiing. It is, however, a significantly more difficult route than the one beginning at McKinney Creek where parking is exceptionally difficult and snowmobiles use the snow-covered road from the trailhead. An interesting one-way tour is created by combining the two tours. This tour begins with more than two miles of groomed trail through Sugar Pine Point State Park. The easy going on this stretch tempers the tour which grows in difficulty as you leave the Park and enter the upper reaches of General Creek. At the head of General Creek you must climb out of the drainage and navigate with map and compass to the lake and hut. Ludlow Hut, built by the Sierra Club in 1955, is located on the northern edge of Desolation Wilderness. It was built by friends and family as a memorial to Bill Ludlow who lost his life at the age of 23 while serving with the Army Corps of Engineers during the Korean War. As one might expect, reservations for weekends and holidays are difficult to obtain. 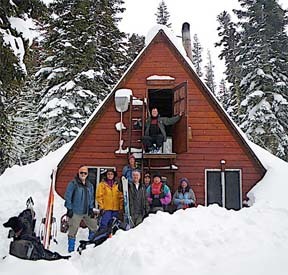 Volunteer for a summer or fall work party at one of the Sierra Club's huts to get reservation priority (contact Clair Tappaan Lodge for more information). From the trailhead (1) follow the groomed trail south and then west for a total of 0.4 mile until you reach a trail junction (2). The Blue Trail is to the north (right). Continue west (straight) on the groomed trail for 0.6 mile until you reach a trail junction (3). Again to the north is the Blue Trail. Continue west (left) on the groomed trail for 0.4 mile until you reach a trail junction (4). To the southeast (left) is the first bridge across General Creek. Follow the groomed trail southwest (straight) for 0.9 mile until you reach a location just to the north of the second bridge (5) across General Creek. 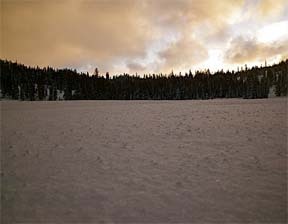 In this section you may encounter several other groomed trails. The route you want is the one that parallels the creek to the southwest and has very little elevation change. It should be obvious. Leave the groomed trail and ski generally southwest along the north side of General creek for 1.9 miles until the slope to the north hems you in along General Creek (6). This point is a short distance west of where the creek draining Lost and Duck lakes meets General Creek. Cross to the south side of General Creek and continue skiing slightly south of west for 1.3 miles until you reach the head of General Creek (7) and can see a moderate route ahead to the northwest. Traveling in this section can be very slow in low snow conditions. The location of where you cross to the south side of the creek is not critical, but at some point you will find it necessary. Ascend northwest out of the General Creek drainage toward a very broad saddle and then ski west for a total of 0.8 miles until you reach Ludlow Hut (8). An alternative is to cross back to the north side of General Creek approximately where the summer trail crosses back to the north side, and then ascend out of the drainage approximately where the summer trails lies. Avoid any slopes that are unstable if you choose that route. Ludlow Hut is located about 100 yeards east of Richardson Lake and slightly above it. Retrace the route for 6.3 miles back to the trailhead (1).